Farm to Table: A postmortem - O! Mr Speaker! You have 48 hours of adventuring time in a country you've *never* been to, and *may never* return. By random chance, There is a 48 hour game jam happening simultaneously. A sacrifice must be made: the game or the experience? Choose wisely. Trick question! You can do both, poorly! Welcome to my Ludum Dare 43 entry for the theme "Sacrifices must be made". My game - Farm To Table - has you training your workers, breeding them to improve, and possibly grinding them up to make the tastiest burgers in the business! The gameplay centers around selecting the lil' workers from the queue and assigning them to different tasks: farming, cooking, breeding, and, well, getting crushed into mince meat. Through careful breeding you can create better cooks and farmers. But here's the rub: Thanks to their superior breeding, the best workers are also the tastiest! Naturally, the people in charge - the "steakholders" - require profit$ (and therefore burger quality) to be continually on the rise. Your business must maintain its status as a viable investment target. ("Here's the rub" is a thing people say, right? Sounds weird.) Anyway, that was supposed to be the idea. A difficult-but-enjoyable balance of inputs, transformations, and outputs. In practice I ran out of time for the vital "balancing of the systems" part. So you are able to transform the inputs, but the outputs have exactly zero impact on the next round of inputs when they feedback. You can't actually make better burgers. In fact, your profits-from-sales aren't even tracked at all. Oops. Still, I was pretty happy with the result. In Ludum Dare there are thousands of games for the players to rate. I figured that as long as it was fun-ish for players to try and figure out the controls (and the rules of the game) then it would still be ok. And really, most people won't play long enough to realise that there is no goal anyway! ...It was late Friday afternoon when I learned that LD would be commencing shortly. That was tempting - but there was no way I could justify wasting the entire weekend holed-up in my hotel room, instead of exploring my new surroundings in a beautiful new country... Could I? Then the theme was announced. It was a good one. Plus, it was dark and cold outside. Certainly not a night for exploring. I'd just tinker on something for the evening, then start my outside-adventuring in the morning. By the time morning rolled around I had yet to go to sleep. It seemed wise to put off adventuring - at least until the afternoon. My Ludum Dare plan was to build a simple "economy game" because it's something I'd never done before. The thematic inspirations emerged from one of my favourite movies (Soylent Green), and one of my favourite Commodore 64 games (Mad Doctor). Economy games need "sources", "syncs", and a way to transform them. In my economy, the sources are people and the syncs are the conveyor belts that create the burgers. You can transform the statistics of the inputs by breeding the best "outputs" to make even better "inputs". To stop an uncontrolled positive feedback loop, it's required you sacrifice your best workers in order to create the tastiest burgers. 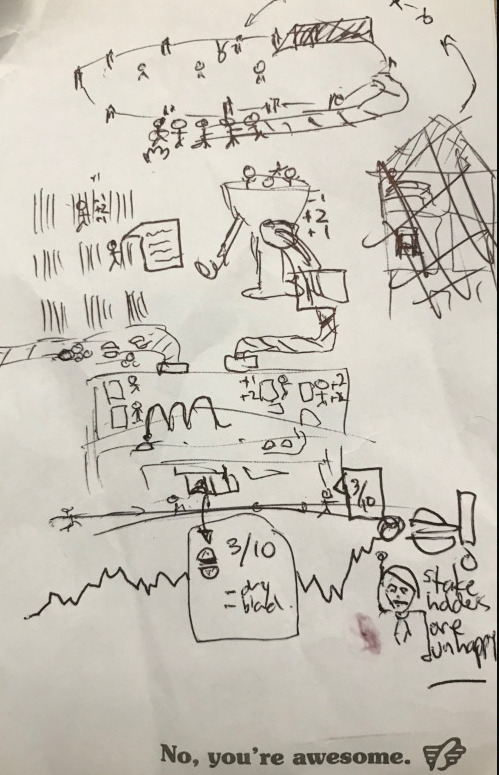 Although it wasn't all implemented, the final product turned out pretty close to my back-of-the-napkin sketch: so I'd say that was an achievement earned! The build process began with a rough mock-up of the playfield in Aesprite. This was just a horribly rushed effort that would be replaced with real graphics later (spoiler: in Ludum Dare there is no "later". The graphics remained unchanged). I liked the Mad Doctor style, and I also liked that it wouldn't be Yet Another Grid-based Game like nearly all my past Ludum Dare entries. To turn the image into something playable I decided to go with Phaser3. 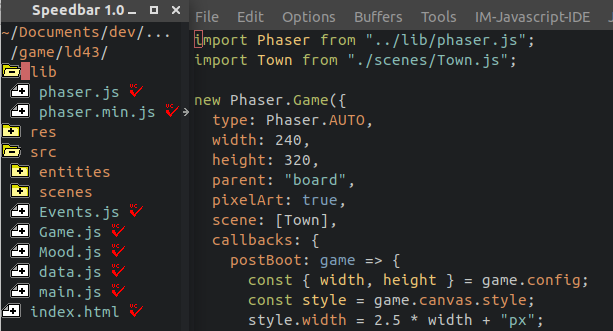 Normally I like to use my own engine, or even start from scratch - but I'd been wanting to see what's new in Phaser and this seemed like a good way to find out. Phaser takes a PHP-style kitchen-sink approach to API design: just add every feature you could possibly think of. Before you bother building something be sure to search the docs and see if it isn't already included out of the box. It might seem a bit in-elegant at times, but at 4am in the middle of the jam I was glad I didn't have to roll my own Phaser.GameObjects.RetroFont routine again. Using unfamiliar tech in a Ludum Dare is usually asking for trouble, but in this case I kind of knew Phaser2 - and my game wasn't doing anything too crazy - so it turned out fine (frequent grumbling about documentation and mystery-meat factory methods aside). Look ma, no build tools! There's something I really like about the simplicity of a "plain-old-project". I love knowing that I will be able to run (and tinker with) this project in 10, 20 years time (like my first ever browser game, Some Adventure Guy, from 14 1/2 years ago!) - without having to try and resurrect some long-dead build tools and dependencies. Thanks to an extended nap on Saturday (coupled with the crazy-early setting of a northern-hemisphere winter sun) I missed out on any real-life day-time adventuring. I did, however, get a system working for clicking and dragging my lil' peeps to the various sections of the world. I decided to write off Saturday as a no-tourist day - I'd get outside tomorrow. For sure. In the mean time, I had a passable version of "conveyor belts" working... this was achieved by assigning a conveyor-belt-ish animation to a sprite after it was created. There's absolutely no logic - just an animation that moves it to its correct spot if nothing else is removed. So multiple items will often overlap and look bad. This bug was then placed on the "fix later" pile (spoiler: never fixed). After adding the meat-grinder mechanic (and successfully pushing out a few cooked burgers) I decided to take a break from coding and do 15 minutes of sound effects. This turned out to be my favourite part of my LD entry. Normally I make the sound effects and music on my home studio setup: some midi gear, Ableton Live, and all of my plugins. Being on the road I had none of my usual sound-making arsenal, so some improvisation was necessary! A hotel shower, an apple, and a good old-fashion mouth-pop resulted in the horrifically-perfect and unsettling sound effect. The rest of the audio: music and sound effects - were done under extreme time pressure, moments before I submitted - and were crap. But the bone-crushing grinder sound effect was perfect! By Sunday I'd all but given up on sight-seeing and had gone all-in on Ludum Dare. But there was an issue: less than 6 hours remaining and the project was in a bad state. The controls were completely un-learnable, the burger-making progression system was overly complex and opaque, there were no instructions, and everything was absolutely confusing to anybody who wasn't me. Sensing the train-wreck ahead, it was time for a sharp detour. I would sacrifice the entire point of the game in order to have something that might possibly be "confusing-but-in-a-good-way" for new players. As long as it was kind of fun to figure out the controls - the player would feel a bit clever, and hopefully not notice there was no actual game. That was the new plan. Ruthlessly I ripped out the mechanic that defined the game: being able to manually adjust a worker's stats using XP points you earned by cooking tastier burgers. By doing this, I could greatly simplify the control system. Now "hover" would display stats and single-left-click'n'drag would move workers. That was it. I asked a stranger at the hotel cafe if they would kindly test a game where you mince up people into meat patties. They were surprisingly happy to help out, and they fairly quickly figured out they needed to drag and drop the little people around. The simplification had worked, and I had something passable! And there was still two hours remaining in the competition. Plenty of time to re-balance the game by tweaking the breeding system, and reworking the burger-ranking system I tore out earlier. I could see exactly what I needed to do to make the game playable! But sacrifices must be made. Although it pained me to stop so close to the finish line, I made a tough executive decision. I would use the last two hours of weekend daylight - sacrificing the last two hours of Ludum Dare #43 - to traverse a breathtaking suspension bridge, that crossed a giant ravine, leading into the heart of a wonderland rain-forest. I'd be tourist. The final product was not really a game, it wasn't very polished, it didn't have good music, it wasn't particularly fun to play... but it was one of my favourite Ludum Dare entries so far. I loved the weird graphical style, the hand-made sound effects, and the general "oddness" of it. I had an idea of what I wanted it to be, and it turned out pretty close to what was in my head. In the end it was the gamedev equivalent of jazz music: I had more fun creating it than others will have consuming it. I'm fine with that. So, was my sacrifice (giving up a once-in-a-lifetime weekend of adventuring) worth the stress and panic of trying to make a bad game vaguely playable at the zero-hour? Who can say... but see you for Ludum Dare #44! This was written by Mr Speaker. Posted on at 8:03 am. Filed under Game, HTML5, Nerd. Bookmark the permalink. Follow comments here with the RSS feed. Trackbacks are closed, but you can post a comment.